22일 서울중앙지법 앞에서 ‘죄 없는 박근혜 대통령을 석방하라!’는 태극기집회를 가진 대한애국당은 24일 서울고법 형사4부(김문석 부장판사)의 ‘박근혜 대통령에 대한 항소심 선고’를 앞두고 “좌파독재정권은 지금 대한민국 역사상 전례 없는 촛불떼거리의 권력찬탈에 의해 국민 과반수에 의해 선출된 대통령을 509일 동안 정치적 인신감금, 살인적 정치보복을 가하고 있다”며 “박근혜 대통령에 대해 탄핵 인용 판결을 냈을 때, 이미 사망해버린 대한민국 사법부이다. 그럼에도, 2심 선고를 내릴 재판부가 대한민국에 아직 공정과 법치와 정의가 살아 있음을 명심해줄 것을 바란다”는 입장을 밝혔다. 태극기혁명국민운동본부(국본)는 8월 24일 박대통령 2심 선고 공판에 관해 ‘긴급 성명’을 통해 “박대통령 위헌파면 진상규명과 인권탄압 문제 해결 없는 문재인 세력은 더 이상 국민의 신뢰를 받을 수 없다”며 “2017년 3월 10일 헌법재판소의 판결은 헌법재판소 스스로 대한민국 헌법 84조를 위반한 탄핵 소추와 파면으로 원칙적으로 무효”라고 주장했다. “이후 박대통령 구속과 재판의 비상식적, 살인적 재판 일정과 계속된 구금은 형사소송법상 무죄가 확정되지 않은 피고의 권리를 심하게 해치고 있다”며 “박대통령 본인에 대한 인권탄압은 물론 국론을 심각하게 분열하고 있다”고 지적했다. 도주우려, 증거인멸 우려가 전혀 없음에도 인신구속이 계속되는 박근혜 대통령에 대한 탄압을 두고 국본은 “형사소송법 원칙에도 맞지 않는다”며 “이는 1948년에 선언된 문명국가가 준수해야 할 세계인권선언 정신에도 위배되는 반문명적 작태”라고 규정했다. “대한민국이 1990년에 가입하고 국회가 비준하여 그 즉시 효력을 갖는 국제인권규약, 즉 B규약(시민적, 정치적 권리에 관한 조약)과 선택의정서를 전부 위반하고 있다”며 국본은 “거듭된 강도 높은 수사와 재판과정을 통해 박대통령에게 씌워졌던 뇌물수수, 국정농단 등의 혐의는 사실상 전부 특정세력이 주도한 마녀사냥이었음이 드러났다”고 주장했다. 국본은 “그럼에도 재판부는 불구속 재판 등 최소한의 전향적 조치도 취하지 않고 있다”며 “이는 대한민국의 수치이며, 법치주의 포기”라고 주장했다. “우리는 야당이 이 문제를 더 이상 좌시하지 말고, 즉각 UN을 포함한 관련 국제기구에 정식으로 문제제기할 것을 강력 촉구한다”며 국본은 “국제사회 여론 특히 혈맹 미국 및 가까운 일본 등에 호소해 바로잡을 것을 요구한다. 박대통령 2심 선고 공판인 8월 24일에 무죄 석방되지 않을 경우, 법치주의 수호를 위해 국본 스스로 국민을 대신하여 이에 나설 것”이라고 주장했다. 국본은 불법 정권은 물론이고 기회주의 야당도 인정하지 않을 것이라고 밝혔다. 박대통령 위헌파면 진상규명과 인권탄압 문제 해결 없는 문재인 세력은 더 이상 국민의 신뢰를 받을 수 없다. 1. 2017년 3월 10일 헌법재판소의 판결은 헌법재판소 스스로 대한민국 헌법 84조를 위반한 탄핵 소추와 파면으로 원칙적으로 무효다. 이후 박대통령 구속과 재판의 비상식적, 살인적 재판 일정과 계속된 구금은 형사소송법상 무죄가 확정되지 않은 피고의 권리를 심하게 해치고 있다. 도주우려, 증거인멸 우려가 전혀 없음에도 인신구속이 계속되며 박대통령 본인에 대한 인권탄압은 물론 국론을 심각하게 분열하고 있다. 형사소송법 원칙에도 맞지 않는다. 2. 이는 1948년에 선언된 문명국가가 준수해야 할 세계인권선언 정신에도 위배되는 반문명적 작태다. 또한 대한민국이 1990년에 가입하고 국회가 비준하여 그 즉시 효력을 갖는 국제인권규약, 즉 B규약 (시민적, 정치적 권리에 관한 조약)과 선택의정서를 전부 위반하고 있다. 3. 거듭된 강도 높은 수사와 재판과정을 통해 박대통령에게 씌워졌던 뇌물수수, 국정농단 등의 혐의는 사실상 전부 특정세력이 주도한 마녀사냥이었음이 드러났다. 그럼에도 재판부는 불구속 재판 등 최소한의 전향적 조치도 취하지 않고 있다. 이는 대한민국의 수치이며, 법치주의 포기다. 4. 우리는 야당이 이 문제를 더 이상 좌시하지 말고, 즉각 UN을 포함한 관련 국제기구에 정식으로 문제제기할 것을 강력 촉구한다. 또한 국제사회 여론 특히 혈맹 미국 및 가까운 일본 등에 호소해 바로잡을 것을 요구한다. 박대통령 2심 선고 공판인 8월 24일에 무죄 석방되지 않을 경우, 법치주의 수호를 위해 국본 스스로 국민을 대신하여 이에 나설 것이다. 우리는 정부 여당은 말할 것도 없으나, 기회주의 야당에 대해서도 더 이상 그 권위를 인정하지 않을 것임을 분명히 밝힌다. 5. 또한 현 시국 관련, 향후 수개월~십수 개월 내 일어날 모든 예측 가능한 비상사태 전개에 있어, 국본은 1948년 건국된 자유 대한민국을 부정하고 반인륜적, 반민족적, 반문명적 전체주의 대량학살 사교체제인 김씨 독재 연장에만 기여할 현 주사파 정부여당도, 무기력과 무책임, 무능의 극치를 달리는 야당도 아닌 시민 스스로의 독자적 판단과 조직, 네트워크로 이 정권을 심판하고 하야시킬 때까지 가능한 모든 수단과 자원을 동원해 전면 투쟁에 나설 것이다. 6. 일련의 모든 사태는 평양 권력 붕괴와 직결되어 있음을 우리는 잘 알고 있다. 따라서 대한민국의 법치주의와 진실의 최소한의 회복 바로미터가 될 박대통령 복귀와 명예회복은 물론, 이를 넘어 저 38선 이북을 강제 점령한 불법공산집단인 수령왕조를 타도하고, 자유통일로 갈 때까지 가능한 모든 수단을 동원한 전면 투쟁을 전개할 것이며, 각성한 시민의 힘으로 태극기 혁명을 통해 반드시 이를 관철할 것이다. 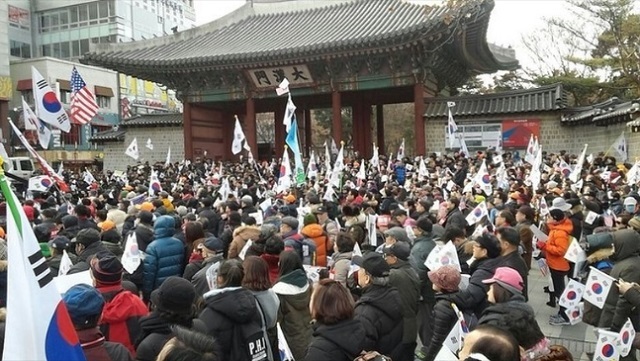 Moon Jae-in administration can no longer be trusted by Korean people without duly investigating President Park’s unconstitutional impeachment and her human rights violation. 1. The impeachment of President Park Geun Hye and Constitutional Court's ruling on 10 March 2017, is in principle null and void, as it violated the 84th clause of ROK (Republic of Korea) Constitution. 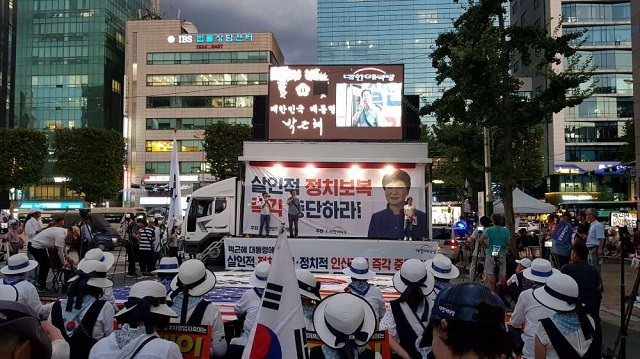 Right after the event, President Park was arrested and was immediately put into a deadly trial process and has been continuously detained since then. All these have seriously hurt the right of defendant who has not been finally sentenced as ‘guilty’ by the criminal law. Even if there is absolutely no concern of her escape or evidence destruction, her imprisonment continues, not only violating her human rights but also severely dividing the public opinions. 2. All these are particularly against the spirit of the Universal Declaration of Human Rights made back in 1948, which any civilized country should abide by. Therefore they are nothing but anti-civilization acts. In addition, they totally violate International Covenants on Civil and Political Rights (and its Optional Protocol), which ROK signed up in 1990 and its National Assembly ratified, thereby making it immediately effective. 3. Repeated high intensity investigations and lengthy trial process have revealed that all charges against President Park, including bribery and the ‘monopoly of state affairs’, is actually a witch-hunt which was driven by a certain force. But the court has not made any progressive move. This is a total shame on ROK and the complete abandonment of ‘the rule of law’. 4. 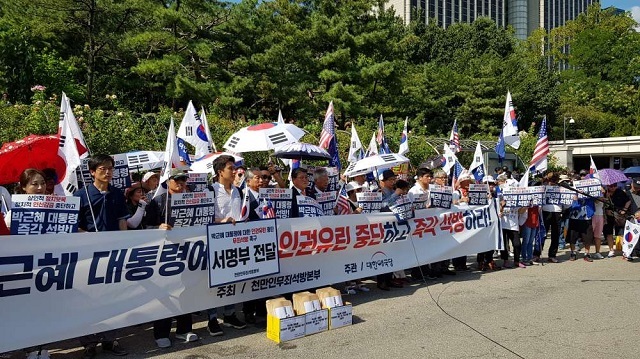 We strongly demand that opposition parties should raise the issue to all of international organizations including UN, asking them correct it and appeal to the international community, especially ROK’s allies including the United States and neighboring Japan. President Park’s second sentencing session will be held on 24 August. If she is not freed on the basis of ‘not guilty’ on that day, we will vehemently step forward on behalf of Korean people, for the sake of defending our constitution. We solemnly declare that we will not, in this case, acknowledge not only any authority of the present administration and ruling party, but also that of all opportunistic opposition parties. 5. In the course of any predictable emergency situation that will possibly happen within the next several to dozen months, we will go for all-out struggle using all of our available means and resources, until the present administration is duly judged and forced to resign by the Korean people’s own judgement, organization and networks. We vividly know that this administration will hardly be pulled down, either by the ruling party obsessed with Kim Il-sung serving “National Liberation” idea or by opposition parties that are extremely helpless, irresponsible, and incompetent. In particular, we note that the ruling party and present administration will certainly contribute to the life extension of North Korean regime that is nothing but a pseudo-religion group, which has been anti-human, anti-national, totalitarian, and genocidal, and has consistently denied free ROK founded in 1948. 6. We are well aware that a series of these recent events are directly related with Pyongyang regime’s collapse. Therefore, we will promote all-out struggle, utilizing all of our available means, for the return of President Park and the restoration of her honor, which will be a minimum barometer of recovery in Korea's rule of law and truth. On top of it, we will continue to make a full-scale fight until North Korean Kim ‘dynasty’ that has illegally occupied our land over the 38th parallel is toppled down and two Koreas are unified into a free nation. We will make it happen through the Taegukgi revolution driven by the enlightened Korean people’s power. Announced by the Spokesman Room, Taegeukgi Revolution National Movement Headquarters.